In 2014, the first regulatory requirements of the Foreign Account Tax Compliance Act (FATCA) will require financial institutions across the world to comply with new reporting and withholding requirements. This necessitates new operational systems designed to identify US tax-liable entities at the point of on-boarding and a holistic view of existing client and account bases to run the appropriate FATCA scoring of a full client relationship. 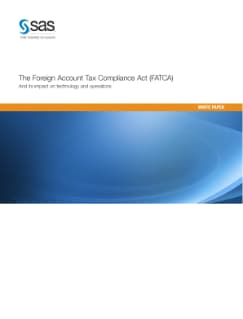 This white paper takes a look at both the immediate and long-term implications of FATCA and outlines how SAS can help FFIs prepare for the challenges ahead.